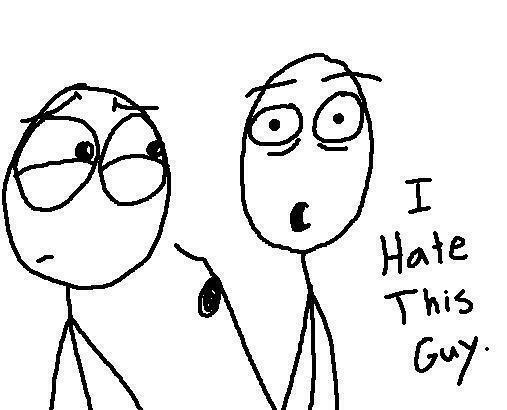 I’m not talking about hating people (like illustrated in the image above) either. Rather, I’m talking about actions and behaviors that don’t fall in line with what God instructs through the scriptures. A comment about Christianity that I hear often is that we shouldn’t judge or “hate” on certain behaviors or actions because that’s not loving (“God loves me just the way I am! Stop judging me”). I’m not sure where this thinking came from originally but often our response is to try to be as accommodating as possible. Don’t get me wrong, there are times when being silent and “letting it go” is the right approach – but I find no Biblical evidence that compels me to bend over backwards for everything. I don’t believe that is What Jesus Would Do (remember WWJD bracelets? – ah, the 90’s). Yes, God is love. But God also hates some things. This is not a contradiction and just because it can be difficult to understand doesn’t mean we should ignore the fact that He doesn’t approve of everything we do, say, or think. If God, who is perfect, can hate certain actions or behaviors, shouldn’t that mean that we (who are made in in His image) can express hatred as well? Especially concerning things that we know He hates? There is one thing I know I hate and that is the individual church fan-dom that seems to have taken over the modern day Christian Church in America. I can’t understand how anyone can find it ok to pit “church vs church” when we all play for the same team. I don’t care if you’re Baptist, Lutheran, or Methodist. Protestant, Catholic, or Orthodox – we may worship differently and our understanding of some scripture may be different but if you put your faith in Jesus, Son of the Living God, we’re still on the same team. Even church leaders are not exempt – I’ve overheard passionate discussions on how to “win back” people who have “defected” to the church down the street on multiple occassions. I absolutely, with everything in me, hate that attitude. Whenever I hear things like that, my (inner, silent) response is always this: grow up – since when did worshiping and serving the Creator become about you? How dare you think that the big point of God’s church is your opinion on the color of the carpet or the quality of the multimedia system. Open your Bible and read it: I challenge you to find anything the supports your “it’s all about me and my worship experience” attitude. God hates those things that deny His glory and/or distract His people from His glory. He hates sin. I have to conclude therefore that the common Christendom expression that “God hates the sin but loves the sinner” is accurate. I have to accept that hate, in and of itself, is not wrong. Here it is boiled down – a TL;DR for you who skimmed the page: hate can be a good and holy response to things that don’t bring glory to God; if you don’t get bothered by sinful behavior and in turn accept everything then you’re really standing for nothing.